From “Curious Gorge” by Scott Cook: Ahh yes, Multnomah Falls… the Gorge’s signature icon, 620 feet of WOW visited annually by about 2 million people. 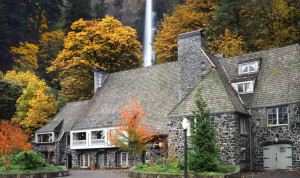 Expect a crowd and you’ll love Multnomah’s neck-stretching grandeur, but expect a peaceful forest setting and you’ll freak out at the summertime crowd of hot dog/espresso/ice cream consuming masses that gather near the concession area. NOTE: the steep, paved 1- mile trail to the top of Multnomah is often choked with smokers, strollers, annoying cell-phone chatters, and probably some cute poodles/terriers too. The view from the top really isn’t worth it – the view is mostly just the parking lot with E-W views blocked. If you want a short hike, you’d be much better off going up to see Ponytail Falls (2 miles to the east) Wahkeena a half-mile west. But wait, is there any way to escape the tourist hordes? Yes, emphatically yes! 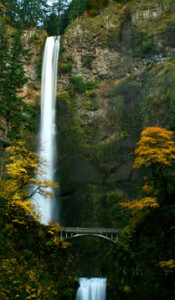 The trail up Multnomah Falls begins one of the Gorge’s most scenic loop hikes. Yup, the 5-mile route heads up Multnomah and then cuts west to descend along Wahkeena’s whitewater creek. 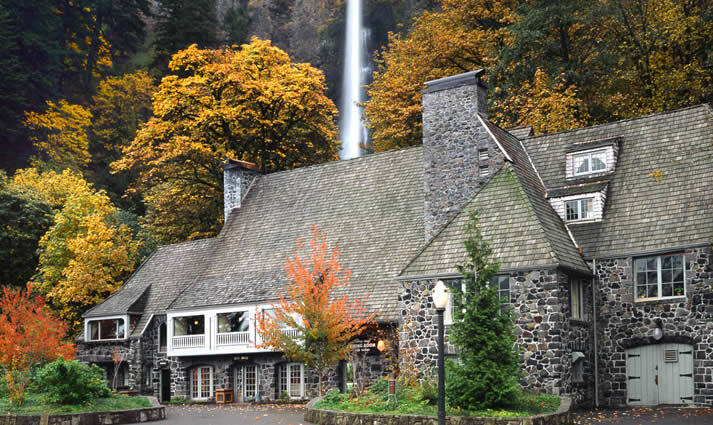 After descending the 1.6-mile entirety of Wahkeena Creek – from headwaters springs to Historic Highway finale – you’ll then pick up a trail that parallels the Historic Highway a half mile back to Multnomah. Such a sweet loop! Multnomah’s upper reaches, once you pass the lousy viewpoint atop the falls, becomes 95% less crowded and 100% excellent. You’ll pass two upper waterfalls then cross over to Wahkeena where you’ll witness the creek-spawning springs, photogenic Fairy Falls, and then the super-mossy creekside downhill to Wahkeena’s splashing finale (Wahkeena is mossier than most streams because spring-fed creeks don’t flood, thus letting mosses build up a velvety green carpet). Time completion of this hike is a complete guess! The purpose of this adventure is get us OUT, get us FIT & have FUN while exploring the beauty that surrounds are area! Each individual is encouraged to hike at their PACE and enjoy nature! Multnomah has it’s own I-84 exit at EXIT 31. You can also get onto the Historic Highway at either exit 28 or exit 35 and drive the “waterfall alley” to Multnomah. Estimated drive time is 24 minutes from Portland; 32 minutes from Hood River. We’ll meet in front of Multnomah Lodge at 9am! Please register so that we know you are attending. We’ll leave the lodge NO LATER thank 9:15am!